Sony's research and development unit in Japan has made a breakthrough in highly efficient wireless power transfer systems based on magnetic resonance for TVs and other devices. Sony's latest wireless tech can shift 60 watts of electrical power across a space of upto 80cm, promising the dream – a fully wireless entertainment system for the lounge. "Sony Corporation today announced the development of a highly efficient wireless power transfer system that eliminates the use of power cables from electronic products such as television sets," reads the Sony Japan release. "Using this system, up to 60 Watts of electrical energy can be transferred over a distance of 50cm (at an efficiency of approximately 80 per cent, approximately 60 per cent including rectifier)." Sony's contactless electrical energy transmission tech is based on magnetic resonance, via which "electromagnetic energy is only transferred to recipient devices that share the identical resonant frequencies as the energy source, so energy transfer efficiency is maintained, even when misalignment occurs." Sony's new wireless power transfer system boasts a transfer efficiency of 60 per cent. 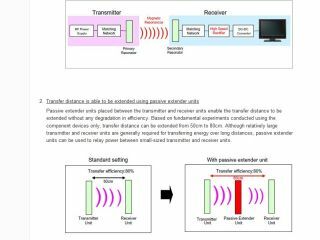 What's more, Sony is developing "passive extender units" that can extend the transfer distance to be extended from 50cm to 80cm, without any efficiency losses.